Handlebar Bags: Which Size for Your Bike? 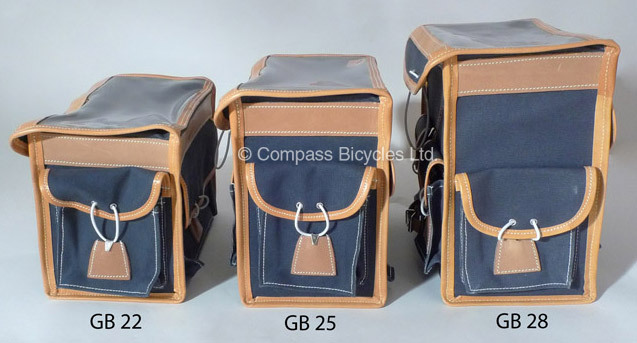 What size handlebar bag is best for you and your bike? Basically, the bag should fill the space between the front rack and the stem. To optimize the bike’s handling, the bag should be as low as possible, and well-supported on a rack just above the front wheel/fender. 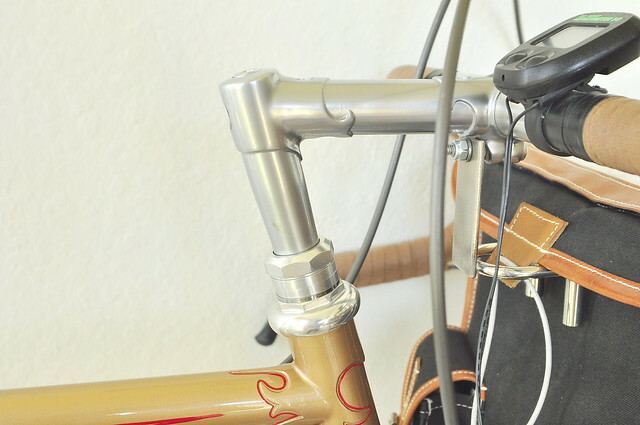 At the top, the bag attaches to the handlebars or stem to prevent the bag from swaying. When the bag’s top flap is level with the top of the handlebars, the bag contents are easily accessible while riding. More space between the wheel and stem means that taller riders use bigger bags. Unfair? Maybe, but a taller rider’s clothes also take up more space. What if you don’t need that much luggage space? Then think of the bag as a fairing; it makes sense to size it so that the bag shields your chest cavity when you are in the drops or the aero tuck. On some rides, my handlebar bag contains only a spare tube, tire levers and some money. I could just wrap those in a piece of cloth and strap them to the rack, but I don’t bother with that, just like I don’t take off the second bottle cage when I go for a ride that requires only a single waterbottle. In my car, I also don’t fill up the trunk on every trip. I think of the bag as an integral part of the bike. If you look at the slightly bulging flap of my bag shown in the photo above, you’ll see that I often fill it to capacity and beyond. Sometimes it’s a day that starts chilly and warms up, and I need a place to stuff my extra clothes. Other days, I pass by the Farmers’ Market on the way home from a ride, and I am glad to have a place to put some vegetables and flowers. The photo above was taken after last year’s Paris-Brest-Paris ride, during a three-day trip across France to visit friends. The large bag meant that I didn’t need to bring the bolt-on rack flanges and panniers. The largest Gilles Berthoud bag has 42% more capacity in the main compartment than the smallest bag shown above, yet it weighs only 11% more (not counting the superfluous stiffener). The weight of the bag comes from the leather reinforcements, pockets, straps and buckles, while the fabric is very lightweight. The larger bags just have a little extra fabric. The weight difference between the largest and smallest bags is 61 g, which is about the same as an empty bottle cage. As mentioned above, I don’t worry about riding with an empty bottle cage on my bike, either. 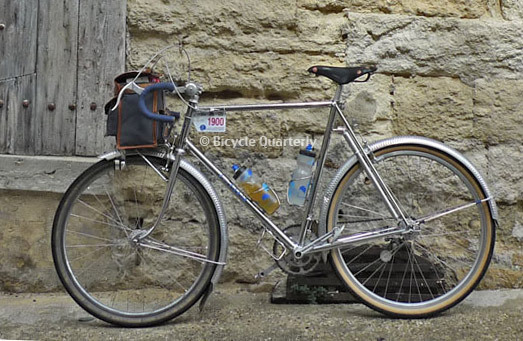 Gilles Berthoud makes their classic handlebar bags in three sizes. This range fits most bikes. If you need something significantly different, Phil Woosley of Loyal Designs, Guu Watanabe in Japan and others can make custom bags to your requirements. Click here for more information on the Gilles Berthoud bags, including dimensions and weights. This entry was posted in Racks/Bags. Bookmark the permalink. 13 Responses to Handlebar Bags: Which Size for Your Bike? Definitely less expensive than a custom bag! I often see large bikes with small handlebar bags and it doesn’t look right to me. The owners’ reasoning is that a smaller bag is better for fast, strenuous riding – which makes me wonder whether they wouldn’t be even happier with no bag/rack at all, but simply stuffing everything in their jersey pockets. Possibly it also has to do with cyclists not wanting to use a decaleur, which is a must for the larger bags but can be avoided on the small ones. Either way, all of this is a non-issue for me: The small bag already reaches the top of the stem on a bike my size, so that would be my natural choice. Can you expand on your comment that the stiffener is superfluous? I’ve found that even with the original Berthoud cardboard stiffener (22 bag on an M13 rack) the edges of my bag significantly start to bend over the edges of the rack, and while this isn’t really an issue, it does make packing and accessing the bag a bit awkward in some situations. I’ve created a replacement stiffener from coroplast that is a significant improvement over the Berthoud one in both performance and weight. Combined with the Berthoud decaluer and the Rene Herse style Al stiffener the bag is super solid and I never had any worry about loading it down if needed. I noticed you’ve also removed your side pockets. This seems like a common modification to these bags, and I’ve considered it many times as the paddles of my Campagnolo shifters will sometimes catch on the pocket closures. When the bag is supported by a rack, I find it advantageous to have the bottom of the bag conform to the rack. This keeps it more stable. The stiffener makes it so the bag is like a box sitting on top of the rack, rather than interlocking with it. The Berthoud stiffener is very heavy, and most cyclotourists I know simply remove it. On my new bike, I made a U-shaped aluminum strip to stiffen the upper perimeter of the bag. The side pockets are easy to remove, but the stitching holes remain visible (even if they don’t leak water). For my new bike, I had Berthoud make me a bag without side pockets. Even without shifter paddles that swing inward, I prefer to have more room for my hands. Furthermore, the side pockets can only hurt the aerodynamics. For touring, they could be useful to carry some small items you want to access without digging through the main compartment, but for my purposes, three outside pockets (one front, two back) are sufficient. Jan, could you post an image of the u shape stiffener, and how it stablizes the upper edge of the bag? What are your thoughts on leather on the bottom of the bag to add some stiffness/support/durability? Your idea of a U shaped support has me thinking about a U shaped decaleur. The U-shaped stiffener simply is a 1.25″ wide piece of aluminum, bent into a U along the upper perimeter of the bag (back and sides). The screws of the decaleur hold it in place. Mike Kone of René Herse Bicycles came up with the idea. I don’t see a need to reinforce the bottom of the bag. My first Berthoud bag has been in almost daily use since 2000, and still works fine. I’m poor and can only afford the Velo Orange bag. 😦 I removed the three plastic stiffeners there as well, they hade a tendency to to move out of their sleeves anyway. Without them the bag sits much better on the rack, but still swings left and right in its top area. I had the aluminium-stiffener Idea as well, but haven’t realized it yet. Actually I was planning to do a full loop and cover all four sides of the bag with a 1″ aluminium sheet, and maybe add to additional screws to the front, but you got me thinking: Maybe a U-shape would be fine as well. Any *good* solutions for those of us with bikes that don’t have accommodations for a front rack? There are a number of make-shift solutions that can work OK in practice. You might check out the Klick-Fix system… of you could have a new fork made for your bike. After all, the bike’s geometry really should take the bag into account, so simply bolting a bag onto an existing bike will always remain a compromise. With a new fork, you can alter the offset (rake) to dial in the geometry – provided your bike doesn’t have a very slack geometry that is less suitable for a front load. The fork can be built for a rack, you can even integrate the connector-less Schmidt SL generator hub, and you are well on your way… A friend did that to his titanium cyclocross bike, and he is pleased with the results. I see that Compass sells both the blue and black Berthoud bags. I’ve seen other references to gray Berthoud bags, but they look blue to my eyes. Are the blue bags that you sell one and the same as what others call gray? Gray and blue are the same – it’s a grayish blue.